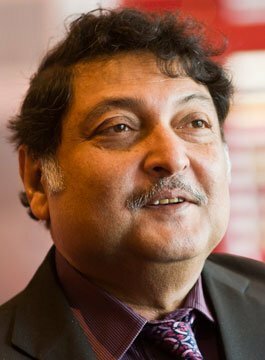 Sugata Mitra is Professor of Educational Technology at Newcastle University in the UK and Visiting Professor at MIT in the US. He was recently described by The Times newspaper as a “Global Education Superstar”. Sugata works in the areas of Cognitive Science, Information Science and Educational Technology. Sugata has been working in these areas as well as in Physics and Energy for over 30 years and holds a PhD in theoretical Solid State Physics. In 1999, Sugata dug a hole in a wall bordering an urban slum in Delhi, installed an internet-connected PC, and left it there (with a hidden camera filming the area). What they saw were kids from the slum playing around with the computer and in the process learning how to use it and how to go online, and then teaching each other. In the following years they replicated the experiment in other parts of India, urban and rural, with similar results, challenging some of the key assumptions of formal education. The “Hole in the Wall” project demonstrates that, even in the absence of any direct input from a teacher, an environment that stimulates curiosity can cause learning through self-instruction and peer-shared knowledge. Sugata’s conclusions on self-organised learning environments (SOLEs) are a result of a series of experiments on unsupervised use of the Internet by groups of children. He concludes that groups of children (usually 8-13 year-olds), given access to the Internet and left unsupervised can learn to use computers and the Internet by themselves, irrespective of who or where they are and what language they know; can achieve educational objectives by themselves; show self organising behaviour resulting in learning in ‘minimally invasive’ environments and understand content years ahead of their time. There is also evidence that children in remote areas show poorer school performance, usually due to the quality of instruction they receive (good teachers tend to migrate away from remote areas), and he is also working on organising retired teachers (sometimes referred to as the ‘Granny Cloud’ or as eMediators) to connect with children remotely, using peer-to-peer video communication such as Skype. Sugata has shown if all of these results are put together, it is easy to create a case for unsupervised environments for children who do not have access to high quality instruction. Sugata is now going around the world to tell people how to do this. Sugata Mitra is also building a stand-alone ‘Self Organised Learning Environment’ where children can learn without physical teachers, in an environment that maintains and runs itself with technology. His “Hole in the Wall” discovery is leading to the design of hardware and software that enable children to reach the intermediate to expert level entirely on their own. His current research is leading towards an alternative primary education using self organised learning, mediation and assessment environments. Sugata’s work inspired the book ‘Slumdog Millionaire’ that went on to become the Oscar winning film of 2009. The global consequences of Sugata’s discovery for closing the digital educational divide have resulted in him receiving many international awards.